St. Andrews Street, Cambridge, CB2. HSBC is a multinational bank providing banking and other financial services such as bank accounts, credit cards, mortgages and loans. Based in St. Andrews Street, Cambridge, HSBC Bank is a bank. 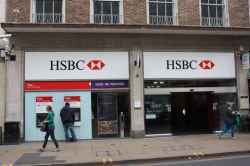 HSBC Bank is in St. Andrews Street Cambridge. You can view a list of neighbouring businesses by going to the St. Andrews Street page. If you would like a list of other listings throughout Cambridge, please visit the Banks and Building Societies section of this website. Note: the pin is positioned at the postcode centre, and may not correspond with the precise location of 63-64 St Andrews Street.